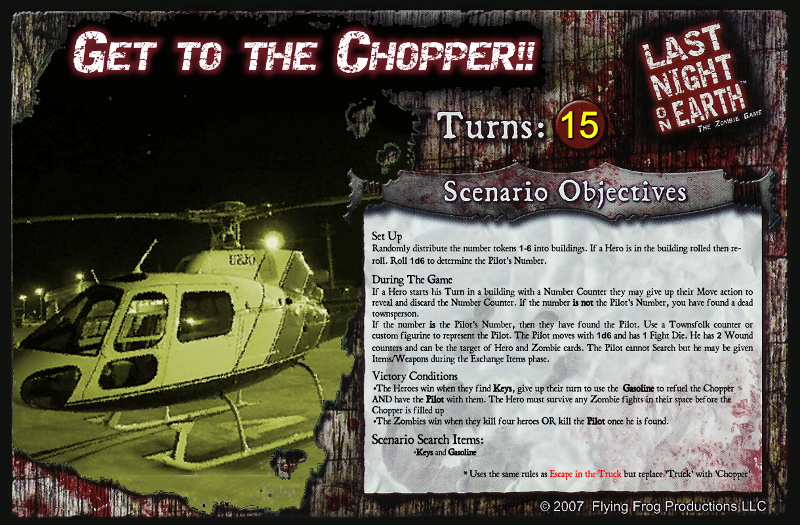 This game concept reminds me of Ledt 4 Dead scenarios when you have to survive the map, and escape in a chopper. I like the model you use, that's sweet, and would add to the visual engagement of the scenario. I need to get this game, and see which other elements of L4D could be incorporated. Check out my one, which I got from a local store at US$1 buck! Yup, cheap as hell! Its a store called Daiso, with origins from Japan. Prob the equivalent of your Michael's in the States. Not only cheaper but a much better size for the boardgame usage. Actual scale during play. Love how it fits snuckly. lol I agree your helicopter is great value! As for scale I think I'll stick with mine Thanks for sharing. I've gone over this. Any thoughts? Did this ever get made into a 'proper' scenario file? (03-26-2014 03:34 AM)BigDumbYak Wrote: Did this ever get made into a 'proper' scenario file? Alas...If only I had the skills of computer wizardry. hmm, methinks me smells a project to work on! Yes indeed. I think I might take this on, If you have no objections. Not surewhat the file size limit is to upload images to the gallery here yet, but here is what I've come up with. The text may be a bit small, but I MUCH prefer my scenarios to be the same size as the ones in the base game. (03-27-2014 04:05 AM)BigDumbYak Wrote: Not surewhat the file size limit is to upload images to the gallery here yet, but here is what I've come up with. Well done! Does anyone have ideas on how to get similar card stock to the originals to print? (03-27-2014 04:14 AM)BriBriSlat Wrote: Well done! Does anyone have ideas on how to get similar card stock to the originals to print? I use the cardboard that you get if you cut open a cheap 3 ring binder. Its about 3mm thick and with a nice high gloss photopaper, you get almost the quality of the original parts. I say almost because this game has some of the best components I've ever seen. Also if you're going to print, use this file. It's much higher resolution. It isn't sized for easy print. I'll get a measurement of one of the original boards tomorrow and make a nice PDF that will print properly.